Pokémon Go is finally playable in Malaysia, have you started catching your very own Pokémon!? If you did you must know what Pokestops, Gyms, Stardust, Candies and the other goodies is all about! Dreading the slow levelling experience? Taking too long to grow your cute Pokémon into killer monsters?! The higher level you achieve, you will obtain new items such as Potions, Crystals, Razzberries and others. All these goodies can be obtained at Pokestops. One of the yummy goodies is the Lucky Egg, which you will receive when you hit Level 9. Gather all these eggs like its a bloody family jewel, as this baby gives you double XP! Find a PokeStop with an already active Lure Module (I’ve spotted 2 places with crazy lures around like christmas tornados, JAYA 1 & Sunway Pyramid, Pretty much hit the malls!) and activate your Lucky Egg so that when the Pokémons start spawning, all the ones you catch will confer you double XP. Bonus: if you catch a new one that isn’t already in your Pokedex, boom! That’s 1,200 XP (100 XP + 500 XP multiplied by two) in your pocket. Line up a whole lot of Pidgeys, Weedles and other commonly found but comparatively low-ranking Pokémons like Ratatas to evolve to get double XP from their evolution. Pidgeys are considered the best because they’re cheap and cheerful – each Pidgey comes with three Candies, and if you transfer it to the Professor as well, you get another candy – that’s a total of four Candies per Pidgey . Considering it only takes 12 Candies to evolve one Pidgey, they’re the most worthwhile evolution. Some reports say that the first Pidgey evolution with a Lucky Egg active will net you 2,000 XP with 1,000 XP for subsequent ones – meaning if you evolve 10 Pidgeys, you’ll get 2,000 XP for the first one plus 9,000 for the other nine Pidgeys. Going by that math, it should be well worth your time to line up as many different types of Pokémons to evolve as you can manage to leverage that first 2,000 XP for every different type. If however you’re after maximum bang for your buck and you can handle evolving all your captured Pokémons and collecting new Pokémons within half an hour, then maximise your gains by combining Options 1 & 2 – drop a Lure Module and Incense at the same time as your Lucky Egg, so that you can get the best of both worlds, namely higher XP for normal captures and evolutions. Once you’re done with that, walk around and activate the PokeStops to collect double the amount of XP you’d get from PokeStops as well within that half an hour. Good luck in your Pokémon Go QUEST! http://knacktech.com.my/wp-content/uploads/2015/07/web-300x138logo-300x83.png 0 0 Knack Tech http://knacktech.com.my/wp-content/uploads/2015/07/web-300x138logo-300x83.png Knack Tech2016-08-10 02:29:252017-03-10 06:40:50Pokemon Go Level Up Guide! Apple at last decided to give its TV box an upgrade worthy of the name last year, and if you’ve bought yourself one of the new devices (or got one as a gift from Santa) then there’s lots to explore—the Apple TV has a simple, straightforward interface but there are still a number of hidden features and tools available to take advantage of. Setting up passwords and networks on a device without a keyboard is never a pleasurable process, but if you’ve got a device running iOS 9.1 or above to hand then you can use it to beam important configuration information to your Apple TV, including your Apple ID and home wifi password. All you need to do is unlock the device, switch on Bluetooth and keep it near the Apple TV while you’re configuring your new bit of kit—the TV box will do the rest. Watch for the prompt during the initial setup process and you can save yourself some time when getting your new box up and running. A swipe down from the top of the remote trackpad while you’re watching something reveals details about the current movie or show as well as giving you access to some additional settings. Switch to the Audio section and it’s possible to change the current language or switch to a different set of AirPlay speakers. On supported iTunes content you can use the same drop-down panel to skip between chapters (tap the Menu button to hide it again). Meanwhile, tapping and holding the left or right side of the top Touch pad on the remote will rewind or fast forward through whatever you’re watching or listening to. You don’t have to settle for the layout of icons and apps presented to you by Apple on its TV device. A long press of the touch-sensitive trackpad button at the top of the remote and the current app icon starts to shake: swipe to move it to a new location on the grid of apps or press Play/Pause to remove it. That means you can get the apps you use most often up at the top of the screen and banish the least helpful ones to the bottom of the list. This only works on the main home screen and only with the Apple TV apps—you can’t use it to rearrange the ‘featured’ carousel at the top of the interface. Whether you’ve gone for the 32GB or 64GB version of the fourth-generation Apple TV, you probably want to keep a close eye on how much room you’ve got left. Go to the Settings app, then select General and Manage Storage to see how much room each of your installed apps are currently using. 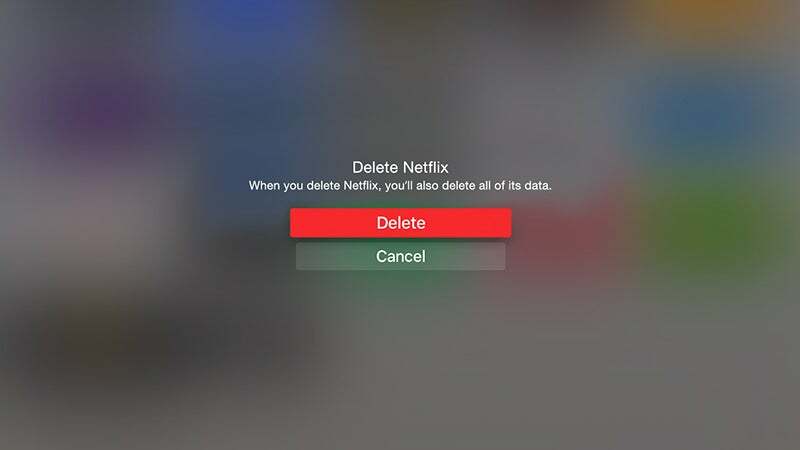 We’ve already mentioned how you can delete apps from the Apple TV home screen, but you can do it here too via the trash can icons that appear on the right. The only apps listed here are the non-native ones that don’t come with the Apple TV—you can’t see details of cached movies and television shows. The selection of games available on the Apple TV when it first launched was fairly limited, but the situation is slowly getting better. If you can find your favorite games on the new device’s App Store then you won’t have to pay again for them (or at least that’s the case with the ones we tested). To quickly check if any of your previously purchased games (or indeed apps) have versions specific to the Apple TV, scroll up from the front page of the App Store interface and then go across to Purchased—you can then drill down into the available selection based on your previous iOS installs. 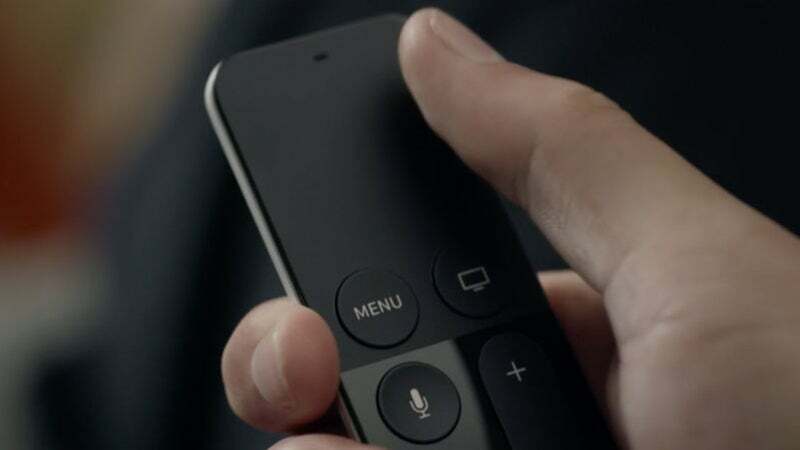 The Siri remote is a big part of the new Apple TV experience and if it becomes unpaired with your device somehow, press and hold the Menu and Plus buttons to connect it again. You can only have one remote paired with your Apple TV at any one time, but that’s unlikely to be much of a problem. Here’s another shortcut trick you can do with the Siri remote: hold down theMenu and Home buttons together and wait until the white LED on the front of the Apple TV starts to flash. This forces a reset of your device, which is handy if an app or the entire Apple TV becomes unresponsive for whatever reason. 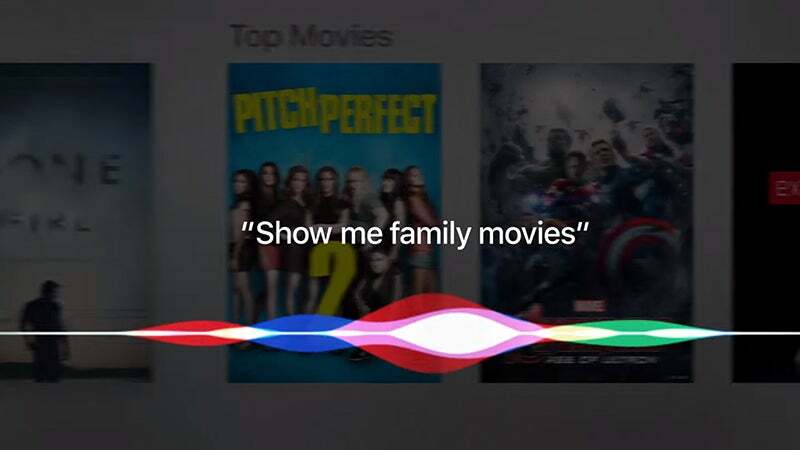 The Siri searching capabilities are of course one of the major selling points of the fourth-generation Apple TV, so make sure you’re fully aware of all the different voice commands that are available: “show that Modern Family episode with Edward Norton” was an example used in the September demo. Try “show me good movies from the 80s” or “show me TV comedies”. You can also ask Siri questions such as “will I need an umbrella tomorrow?” and “what was the Lakers score?” (as on iOS). Press and hold the Siri button (the microphone) to run a command, then talk into the top of the remote. You can make use of the Siri button while enjoying your Apple TV content as well. Use “what did he/she say?” to skip back 15 seconds in a movie or television show and temporarily turn on the subtitles; or try commands like “skip” and “previous track” while you’re inside the Apple Music app. Commands such as “go back 30 seconds” or “go forward seven minutes” work, as do setting commands like “reduce loud sounds”. If you ask “who stars in this?”, meanwhile, you get a roster of the talent in the film or show along the bottom of the screen (press the Menu button) to hide it again. 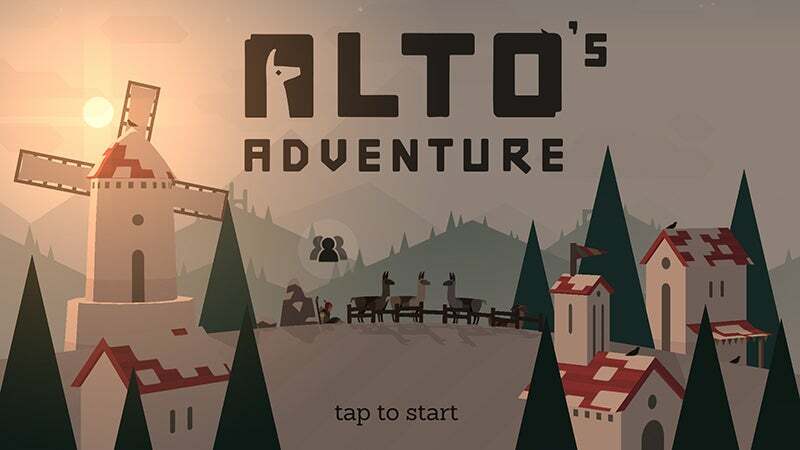 The Menu button takes you back one level through apps and menus, with a double-tap taking you back to the home screen. Tap again from the front page to activate those gorgeous Apple TV screensavers (if you haven’t already installed them, go to General then Screensaver in the Settings app). Then there’s the Home button (with a picture of a television set on it)—this primarily serves as a way of getting quickly back to the Apple TV home screen, but if you double-tap it you get the device’s multitasking page, enabling you to quickly switch between all of your recently used apps. Should you be writing up a guide to the Apple TV or wanting to show off your Crossy Road achievements, it’s not particular difficult to take an Apple TV screenshot (or video) if you have a Mac computer and a USB Type-C cable to hand—although it doesn’t work with DRM-protected content on screen. Hook up your computer to the Apple TV via its USB Type-C port, launch the latest version of QuickTime on OS X and you should be able to see the Apple TV as an input option when you choose New Movie Recording from the File menu. To capture a still, press Cmd+Shift+4 and then hit Space. Why Should I Get AppleCare? Just bought your brand new Apple Device, and thinking if you should have invested in the extended warranty. It is very expensive? Is it worth the purchase? Well find out how it works and why we think you really should really get it. AppleCare is an insurance policy for your devices. You pay an up-front cost to cover any potential problems. 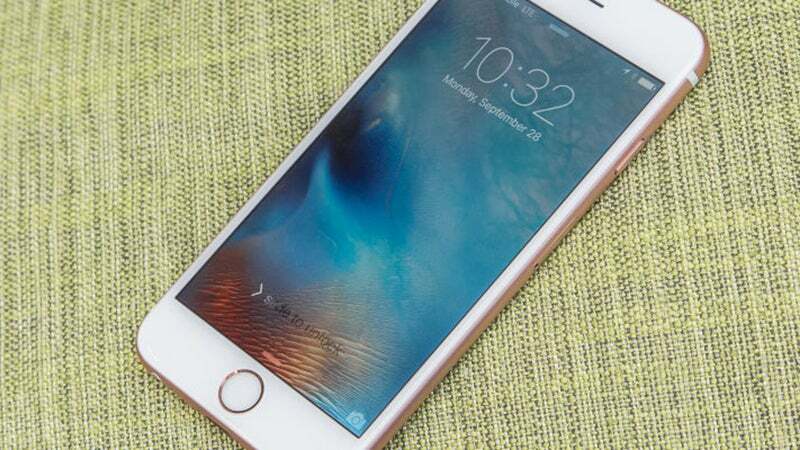 But more precisely, AppleCare plans extend the length of your hardware coverage for both repairs and support. Apple offers four separate plans—for Macs and Apple displays, iPads, iPods, and Apple TVs. AppleCare+ (AppleCare Plus) is not available in Malaysia. How long it extends support: For Macs and displays, AppleCare gets you a total of three years’ support—in other words, it extends phone support by 33 months and the limited warranty by two years (for a total of three years). For all other products—iPads, iPods, and Apple TVs—AppleCare gives you a total of two years of support. When to buy it: It’s easiest to buy AppleCare when you buy your new hardware, but you don’t have to purchase it that way. For Macs, displays, iPods, and Apple TVs, you can buy an AppleCare Protection Plan at any time during the one-year warranty period. As for iPad, you will have to send it in to the authorised service providers. Mac support: For Macs, AppleCare offers parts-and-labor repair coverage from Apple-authorized technicians for the computer, its included accessories (power adapter, for example), and any Apple-supplied RAM. A Mac plan also covers AirPort hardware (purchased up to two years before your Mac purchase or during the term of your AppleCare plan), an Apple USB SuperDrive (for the MacBook Air, MacBook Pro with Retina display, iMac, and Mac mini), and an Apple display purchased at the same time as, and on the same receipt as, your Mac. Add years to your (Mac’s) life. In additional to hardware coverage, AppleCare also gives you access to some software support. Have questions about OS X, iLife, and iWork? Can’t connect to your printer or your AirPort networks? AppleCare for desktop hardware generally costs less than or the same as support for laptops (see price chart below). That makes sense when you consider that portables are more accident-prone and have smaller, more-expensive components. iPad support: Extend your service and support coverage to two years from the date you purchased your iPad. Get repair coverage for your iPad, iPad battery, and included USB cable and power adaptor. AppleCare Plus is not available in Malaysia. So do not drop and break your device. Display support: If you buy AppleCare support for your Apple display for RM370, the plan will extend your support to three years. Beside the display itself, it covers the built-in camera, mic, and speakers; and the power cord. It also includes telephone assistance. Should you pay for AppleCare? Whether AppleCare is worth the extra expense will depend on many factors, but here are a few general questions to ask yourself. Do you use the device for work? If so, consider whether you could do without your device for an extended period of time or be able to come up with the money to repair it on short notice. For a few hundred dollars, AppleCare could give you a guarantee that is well worth the money. Is it better to just set aside some money in a “repair fund” instead? AppleCare is basically an insurance policy, so the main question for you is whether the up-front costs are worth the peace of mind they bring with them. Would you rather set aside some money in case of an accident or pay up front and know that if your Mac’s logic board goes bad in two years, you won’t have to pay RM 2000 to fix it? AppleCare is basically an insurance policy, so the main question for you is whether the up-front costs are worth the peace of mind they bring with them. Should you only consider AppleCare if you plan to get it for all your hardware? If you’re a family with multiple computers, phones, and tablets, the cost for AppleCare can quickly add up. Each device is different, and the chances of them all needing service within the coverage period are slim, so you’re better off targeting the portable devices, those used by the kids, or the ones you know you’ll be keeping for a long time. Save your money on the other products. If you don’t live near an Apple Store, does AppleCare make sense? Although it’s convenient to be able to walk into the local Apple Store with a misbehaving MacBook Air, that’s not the only way to get service. If your town has no Apple Store, AppleCare plans actually give you options you wouldn’t otherwise have: You can talk to Apple about an issue, and if the company decides it’s a problem covered by AppleCare, it will usually send you a box to ship your device in, fix the device, and then send it back to you. As mentioned earlier, AppleCare also works with authorized repair facilities. You can find them by choosing your desired country and following the links on Apple’s site. Do you keep your hardware for a long time, or do you upgrade often? If you’re the type of person who buys a new Mac every year (hey, some people can swing it), then AppleCare may be somewhat pointless. But if you’re like most people, chances are you’re going to keep stuff around longer. Keep in mind that if you sell (or give away) your hardware, you can transfer the ownership of the AppleCare plan, which adds value to the sale price if you want to upgrade after a few years. Mac desktops: AppleCare for desktops is relatively inexpensive, which might make it tempting, but it’s still not really worth it when you figure that you’ll probably plop your computer down in one place and keep it there for a while. Desktop Macs are also pretty reliable. However, It is still a good insurance to have knowing the support is there for year 2 & 3. MacBooks: Considering all the goodness packed into such a small package, a lot can go wrong with a laptop over several years. I generally buy AppleCare with my portable Macs. iPads: AppleCare+ is almost a no-brainer for iPhones and iPads. However, AppleCare+ is not available in Malaysia. However, AppleCare in Malaysia is not that expensive if you compare with the Price you are already paying for the iPad. Personally, I will get AppleCare for all my devices. Anything above RM 2500, to use for 1 year is a little risky for me. I’ve experience Hardisk Failure & MacBook Display failing. Those devices was expensive to replace, and ended up not repairing it as it might be better to buy a new Macbook. So as a company or even personal use, there is no loss investing a little more just to get the ease of mind knowing that your device will last at least 3 years! Now how do I get it? We at Knack Tech will assist you on signing up for AppleCare via our AppleCare Connect Portal. Feel free to Contact Us to find out how you can Extend all your devices with AppleCare. http://knacktech.com.my/wp-content/uploads/2015/07/web-300x138logo-300x83.png 0 0 Knack Tech http://knacktech.com.my/wp-content/uploads/2015/07/web-300x138logo-300x83.png Knack Tech2015-08-18 04:21:122017-03-10 06:46:09Why Should I Get AppleCare? To put it mildly, Apple’s input device roster hasn’t changed much in recent years. The Magic Mouse hasn’t really been touched since 2009, and the Wireless Keyboard is even older than that. The Cupertino crew must be ready to shake things up, though: regulatory filings for both a Magic Mouse 2 and an updated Wireless Keyboard have shown up at the FCC. It’s not certain how the external designs will change (there’s no peek at the top of either model), but they’re definitely going to get an internal upgrade. The peripherals are jumping from Bluetooth 2.0 to the more efficient Bluetooth 4.2 standard, and it looks like they may ditch AA batteries for built-in lithium-ion packs — you might not have to swap batteries ever again. While there aren’t any clues as to when Apple will deliver either the mouse or the keyboard, we won’t be shocked if the two show up alongside new Macs sometime later this year.